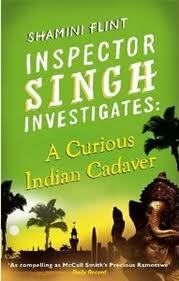 Inspector Singh returns in the fifth chapter of his trademark series, where he journeys throughout Asia busting crimes! Stop No. 5: India . . . Inspector Singh is sick of sick leave, so when Mrs Singh suggests they attend a family wedding in Mumbai, he grudgingly agrees – hoping that the spicy Indian curries will make up for extended exposure to his wife’s relatives. I really did not think this would be my cup of Chai – but was very very pleasantly surprised. Jumping in with a book number five in a series, about an investigator who sounded like he would be all too ‘cosy’ for my tastes, inhabiting a world I know next to nothing about and sounding for all the world like a comic caper about a wheezing overweight troubled ted’ stumbling his way through an investigation. But, hey! – Did I learn the ‘don’t judge a book by its cover’ adage in a BIG way with this one – I thoroughly enjoyed it. Singh is a great creation; yes he stumbles, yes he’s overweight, he wheezes, he sweats and he looks like he just happens to be in the wrong place at the right time if this is anything to go on. But, for all of that, this book is far darker than I was expecting, with little of the slapstick criminal comedy I was expecting from the jolly cover. The suspected murder, or is it a suicide, or is it something even more sinister, could be linked to the fact that the marriage was pre-arranged, or could be linked to something sinister that the young bride to be or her family were working on, an honour killing, or a trust fund that she had in place? The plot crackles along and the heat of the Indian setting is just perfect for a summer day’s read in the garden. Admittedly towards the end of the book there is a ‘Poirot-like’ moment with a cast of characters assembled to hear the crime and the plot described, but that goes totally forgiven as overall the book is a unique and enjoyable read. Pour yourself a nice cold beverage and settle in a really hot place, sit back and enjoy this warm and exotic crime read.